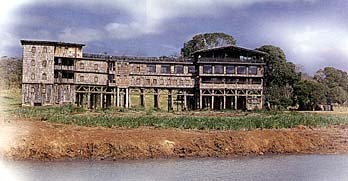 The famous Treetops Hotel started life in a very humble way. In 1932 its first visitors gingerly climbed the wild fig tree supporting the the two-room treehouse. By 1952, Treetops had expanded. 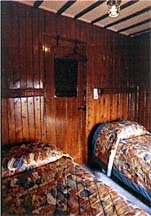 Now a four-room construction, Treetops welcomed, in February of the same year, its most famous visitor. A young English girl climbed the tree as a Princess one afternoon, to descend the following morning Queen Elizabeth II - her father, King George VI had died during the night. By now, Treetops' reputation has spread far and wide and for the globetrotter, the rich, the famous and the fashionable, no visit to Africa was regarded as complete without experiencing the Treetops adventure. Even today, with all the exciting safari lodges and camps Kenya has to offer, 50-room Treetops heads the list for many a visitor. Sited in the heart of the dense lichen-hung forest of the Aberdare National Park's Salient, Treetops overlooks two waterholes and magnificent snowy peaks of Mount Kenya. Throughout the day and night, an endless pageant of wildlife emerges shyly from the bush, making a cautious journey to the water's edge. There's never a dull moment. From the safety and comfort of several observation lounges, guests can photograph at close quarters the territorial charge of short-sighted rhino, a protective elephant matriarch chaperoning her calf, the graceful bounding of a bushbuck doe. A family of lions, have on more than one occasion, made a meal of some poor unfortunate warthog to the fascinated horror of Treetops' diners. For those guests who value their sleep as much as the nocturnal entertainment, everyone is allocated a comfortable bed in either a single or twin room with plentiful shared bathroom facilities, or on request a suite with its own bathroom. If you wish to do your game viewing the 'lazy way', you can be woken by our professional hunter each time one of the big five visits the treehouse! Make sure you don't miss out on an experience of a lifetime. To avoid alarming game, children under 7 years are not allowed at Treetops.